John Mattone’s Lessons of Leadership, Culture & Culture Transformation eBook contains the best of John Mattone’s writings on these critical topics plus John’s interviews with some of the world’s leading experts like Dave Ulrich, Tanveer Naseer, Liz Wiseman, and others. “If you’re like most of my readers, you’re committed to becoming the best leader and person you can be. My life’s mission is to help leaders, future leaders, and organizations become stronger, more vibrant and effective. But the truth is, most people and organizations struggle with these pursuits. 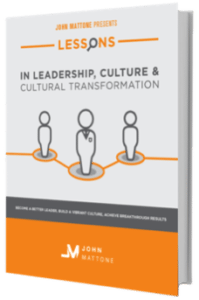 This is the reason I wrote this eBook, Lessons in Leadership, Culture & Culture Transformation” which we hope you enjoy!